Each individual industry puts different demands on the sewing process. We design our products to meet the individual needs of your particular industry, ensuring that you achieve optimum sewing results. 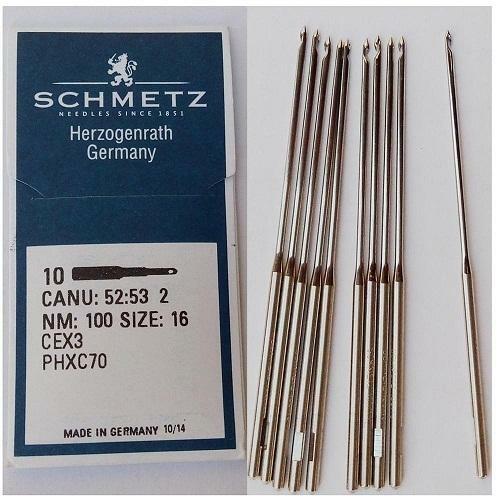 Ever since that year the name SCHMETZ - as family name and brand name - stands for manufacturing of high quality needles for all kinds of textile and non-textile joining processes. Today, after more than 160 years, the family enterprise as well as the brand have established in the most important sewing and textile manufacturing centres worldwide. For designers, producers, fashion ateliers and hobby sewers SCHMETZ is a guarantor for best possible sewing results. Through creativity, continuity and dedication the SCHMETZ Group - with domestic and foreign manufacturing sites and distribution centers around the globe - has developed into an internationally leading supplier for the textile chain while combining the traditional roots and values with the complex demands of global work-sharing textile manufacturing processes. Traditional values, such as inventive spirit, quality consciousness, reliability and sense of partnership, have been extended by global presence, respect within an inter-cultural, work-sharing community, and by responsibility for the environment. These values represent our company's philosophy and are spread by our staff members and through the SCHMETZ brand. The SCHMETZ product and service range represents a comprehensive offer for the individual demands of more than 47 branches of the sewing and textile processing industry as well as for fashion studios and the hobby sector. Highest demands on materials, production techniques and product quality combined with the aim to develop tailor-made solutions for even the most specific applications are the guiding principles of SCHMETZ. That is why products for very specific applications are still made at the SCHMETZ Group's headquarter in Herzogenrath, Germany. In co-operation with the SCHMETZ Development Centre at Stolberg, Germany and the SERVICEHOUSE, the Group's know-how and experience are concentrated, cultivated and developed further. In that way they are at service for SCHMETZ customers for highest individual demands. More than 160 years of experience have taught SCHMETZ to service our customers with knowledge and dedication.